Yesterday, an Uber driver named Maurice dropped me off at Rice University, where I teach a course called “Muslims in American Society.” “Everyone should take that class,” Maurice told me, “It’s more important now than ever.” Maurice said that Muslims are good people, “just like you and I.” We proceeded to talk about the victory of Donald Trump, who regularly exacerbated Islamophobia during his campaign. For the record, Maurice is black, Protestant, grew up in the Midwest, and never went to college. I am white, Catholic, grew up in Massachusetts, and serve as an academic. We are two people with different backgrounds, yet we see eye-to-eye. We are Americans. We are human beings. Believe it or not, this whole “seeing eye-to-eye” thing is not as difficult as some people imagine, though you may have missed this memo if you immerse yourself in Donald Trump’s theatrical universe. Without a doubt, Trump’s rise has stretched the divide among Americans. He has insulted almost every group imaginable: African Americans, Hispanics, Jews, women, homosexuals, and the disabled. Of course, he has also targeted Muslims as Enemy Number One. Internment camps, special registration databases, shutting down mosques, and banning all Muslims from entering the United States sit on the table as Trump occupies the Oval Office. 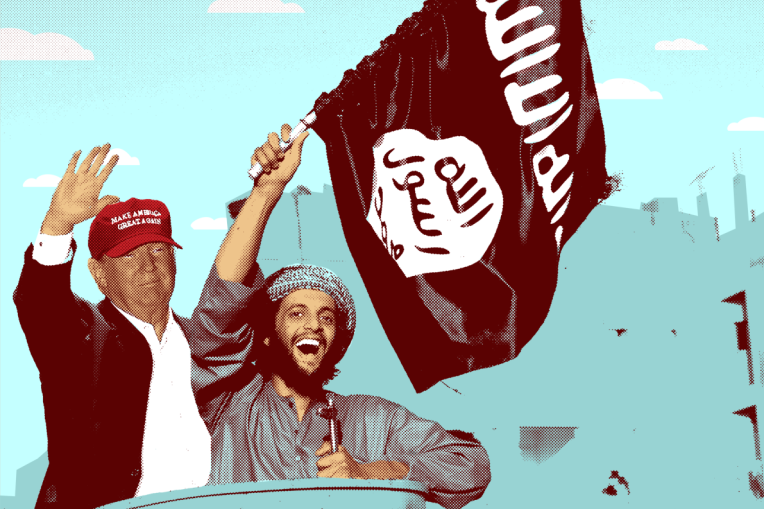 You might think that Trump is the watered-down American version of ISIS, a group which also overtly targets and persecutes minority communities. There is a space between Trump and ISIS that people like you and I often inhabit. It is the space of interaction, learning, friendship, hospitality, and mutual understanding. It is the space of cultural hybridity, where people of various ethnic and religious backgrounds create inclusive communities with flexible group boundaries. For the sake of my argument, let us refer to this space as the grey zone. Make no mistake about it. Trump is an enemy of the grey zone, and his victory means that the grey zone is shrinking. He views the world in black and white terms. He regularly uses rhetoric steeped in the “clash of civilizations,” a rather silly hypothesis developed by neo-conservative thinkers which argues that people’s “incompatible” ethnic, cultural, and religious identities will be the primary source of conflict in the coming years. The world according to the “clash of civilizations” dismisses the historic fact that Christians and Muslims, Caucasians and Arabs, have coexisted peacefully, and indeed have flourished alongside each other throughout the centuries. A few examples include the glories of Al-Andalus, or “Islamic Spain,” and “the other Al-Andalus” in Sicily. ISIS is also an enemy of the grey zone. In a statement published in its online magazine, Dabiq, in February 2015, ISIS encouraged Muslims to “eliminate the grey zone” and warned that Muslims in the so-called “West” will face continued Islamophobia. ISIS wants Muslims worldwide to think within a specific boundary, specifically, that they have two Manichean choices: they are either with “us” (the Muslim community) or “them” (the non-Muslim community). There is no in-between according to ISIS. A person cannot be simultaneously Muslim and American. It is one or the other, either or. Writing in The Telegraph, Myriam Francois-Cerrah discusses ISIS’s views on the grey zone and the ability of Muslims and non-Muslims to coexist with one another. She writes that ISIS wants to destroy the grey zone by convincing impressionable and disgruntled Muslims that they cannot possibly live as Muslims in the so-called “West,” and that ISIS somehow embody the actualization of Islamic ideals in the form of a utopian “state.” Francois-Cerrah also points out that ISIS recruits appear to have identified with the inhabitable grey zone, largely because of the rampant Islamophobia spreading across the United States and Europe. It is time to face reality. Trump is President, whether you like it or not, and it is hard to imagine him doing a complete reversal and suddenly embracing Muslim Americans. It is now imperative that people of conscience come together in a process that I refer to as DEUCE, short for dialogue, education, understanding, commitment, and engagement. First, Muslims and non-Muslims must engage in conversations with one another to break down unnecessary barriers between them. Through dialogue people of various ethnic and religious backgrounds can educate each other on the tenants of their faith and cultural practices. By using dialogue and promoting education, people can then meet on common ground and understand each other as fellow citizens and human beings. The next step in DEUCE, commitment, is when all the efforts put into dialogue, education, and understanding reach a point where people of different backgrounds commit themselves to a certain set of civic principles and agreements that further strengthen coexistence. Lastly, engagement occurs as people who take part in DEUCE share their stories and experiences with others in the wider community, for the betterment of their communities. Trump is not the answer to America’s ills, and ISIS is not the solution to the problems that Muslims face in the “West.” People of conscience should reject ugly rhetoric and reaffirm unity in their own populations. Let me remind you – American values such as religious freedom and citizenship rights mirror Islamic values such as mercy, compassion, justice, and peace. The Founding Fathers and Prophet Muhammad are kindred spirits, not sworn enemies. The grey zone has always existed, yet it is quickly shrinking. We need to cultivate that space. We need to own that space to ensure that bigotry does not triumph humanity. Trump’s Islamophobia is exactly what ISIS wants. Why should we give it what it so desperately craves? Next Post What If “Moderate” Trump Fans Were Asked To Condemn Islamophobia? Lie. Why do people want to lie? ISIS people are not Christen in their works. Muslims are not Christians in their works.. There is a reason for that. Both use the Quran. Trump being against Muslims will also be against ISIS. Muslims and ISIS people are against themselves refusing to repent of their ways.